It all started with a note. It was a handwritten note on the margins of a long-forgotten report, in French, from a well site geologist many years ago who was on a rig drilling into the Paris Basin for conventional oil. That was the Eureka! moment for McKenzie and his team that the Liassic shale in the Paris Basin had the potential to be something very special. It’s big. It’s simple. It’s over-pressured, which generally means bigger flow rates. It’s been known since the 1950s. The Paris Basin is the perfect example of the biggest Mega-Trend I see happening in oil and gas for the next 20-30 years: the export of shale technology around the globe, which should create dozens of discoveries for the industry, and many 5-10 baggers for investors who are able to ride this wave. And the good news for investors is – so far – that many of these plays are being discovered by junior E&Ps (exploration and producers). That can also mean a rocky ride for investors; juniors are by definition more risky and volatile. Toreador’s story is no exception. Back in 2007-08, the company had a suite of European assets, including some production in France, but the company had nearly $110 million in debt with a $40 million market cap. Then the Crash of ’08 hit, and some tough decisions needed to be made. One of those decisions was management. Shareholders asked McKenzie, who was previously President for British Gas Trinidad & Tobago and later CEO of Canadian Superior, to step in as CEO of Toreador in January 2009. 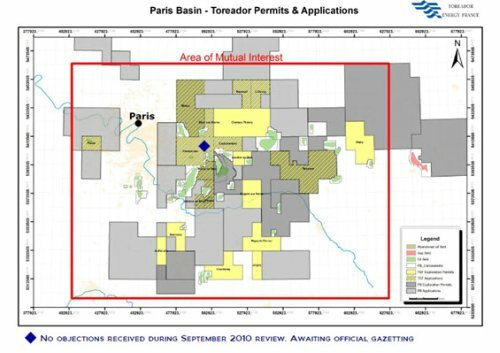 “The one investment we did make was in the Paris Basin.” The Paris Basin is an area of roughly 100 by 150km east, south-east of Paris where Toreador already produces 900 barrels per day of oil (from conventional reservoirs). It was a good choice. But it took some original thinking. “The big majors had been drilling here in the late 1980s, with as many as 18 rigs, and they all had a common view of the source rock. But the thinking was that oil had migrated (up from the source rock shale) to conventional traps. These major oil companies exited because there were just small discoveries. So the new board of directors reasoned they needed to focus on understanding the Paris Basin better, and management started to acquire as much data as they could. “We went searching for old cores in core boxes all across France in warehouses, searching shelves, and plugging them.” This would be the same as splitting core in mining. Some of the core they were able to secure was just the size of a thimble of thread. I asked McKenzie if his peers or the locals thought they were crazy. So the team set to work analyzing an ever increasing amount of raw, unconnected data. The Bakken play in North America also has stacked plates – which are layered geological formations – and three are producing formations. At this early stage in the Paris Basin, it also looks like the Paris Basin would most likely have three producing formations. The data that McKenzie’s team rounded up came from the late 1950s to the early 1990s. Because everyone was drilling through the Liassic shales to reach deeper targets, Toreador was just after incidental information from the drillers and the mud loggers. And it all started to make sense after reading a series of hand written notes in French from geologists made 20-60 years ago. Environmental concerns, disclosures, regulations… just for starters. Well, once you’ve read my new report, you’ll understand this debate better than 99% of the journalists who cover the topic. And you could make a fortune in the process. You see, one company has developed a patented fracking process that eliminates all environmental concerns over oil & gas fracking. And it does this while it increases production of the oil or gas. I’ve been tracking this company closely for over a year. In fact I’m hard at work finishing my newest report, which I’ll be sending over to you shortly — exclusive to OGIB readers. Toreador’s deal with Hess can be as much as $265 million to earn 50% of Toreador’s acreage. So they obviously think the play has great technical merit. While many investors are looking at this play’s success as a given after so much due diligence - Toreador’s stock trades at 6-7x its Net Asset Value (NAV), vs. a multiple of one or less for most oil and gas producers – McKenzie isn’t counting his chickens just yet. “While there is still substantial opportunity, we still have to prove this play works economically, which is a big hurdle. Based on the current stock price, investors are already valuing $11 for this shale play as the conventional producing assets are worth about $4. If the shale is not productive and Hess walks away where does this stock go? Probably close to that $4-$5 level. McKenzie says their first well will is expected to spud in January, and it will be continuous drilling until a first phase – which commits Hess to spending at least $50 million – is finished. He expects the first two wells to be vertical, but there is no decision on wells 3-6 yet. McKenzie adds Toreador and Hess will be looking for variability spatially (how patchy or consistent is the formation), but doesn’t expect much so they could do horizontals very quickly. He voiced his opinion that, if all goes according to plan, the market could see the first IP rates (Initial Production) in late Q1 2011. Vermilion Energy (VET.UN-TSX) also has a land position in the Paris Basin. According to its recent quarterly results, it continues to successfully produce oil from two old vertical wells that it re-entered and fracked in the shale – which contributes to Toreador’s sky-high valuation – but Vermilion has thus far not announced any oil flow rates. Even if the play does work geologically, RBC’s Hanold says there could be other challenges in the Paris Basin, like the lack of energy services (drillers, frackers) and the fact that the landowners do not own the mineral rights. So what kind of well profile does McKenzie expect to see – what would be his best guess on IP rate and economics? 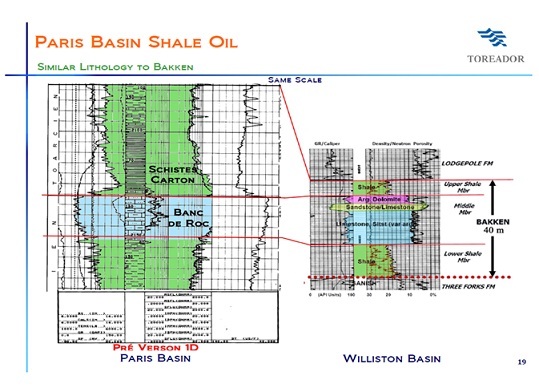 “We’re using 400 bopd (barrels of oil per day) for a 30 day IP with a 50% decline first year,” McKenzie says, adding that the Banc de Roc formation in the Paris Basin looks to be very similar to the middle Bakken at Elm Coulee in eastern Montana. He anticipates that fracking will take a “typical Bakken approach”, and be done by a multi-stage frack over a 5,000 feet lateral distance. The Paris Basin has gone from obscurity to front page news in the global oil patch in just over a year. As a result, there has been a staking rush, and getting land now is very competitive. Toreador has up to 1.6 million acres awarded and pending, and McKenzie says there is a lot of competition for smaller land blocks closer to the edges of the play. “We’re still seeing small players chasing us, but a lot of the US independents have too much on their plates to worry about France. The larger independents don’t see the acreage size to jump into the game now into a new country. 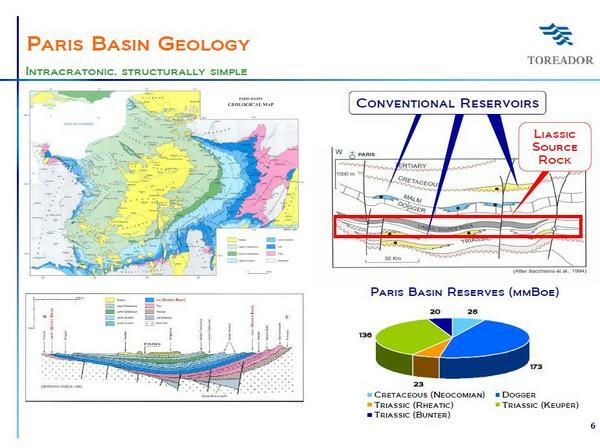 In this phase, the Paris Basin is still frontier, despite its enormous potential. That change McKenzie is talking about could happen at the end of March 2011. With estimates as high as 96 billion barrels of oil resource generated for the Paris Basin, it’s a big play the world will be watching. And it all started with a little note. Keith Schaefer owns Toreador Resources. A rock rich in orgranic matter, which, if heated correctly, will generate oil or gas.